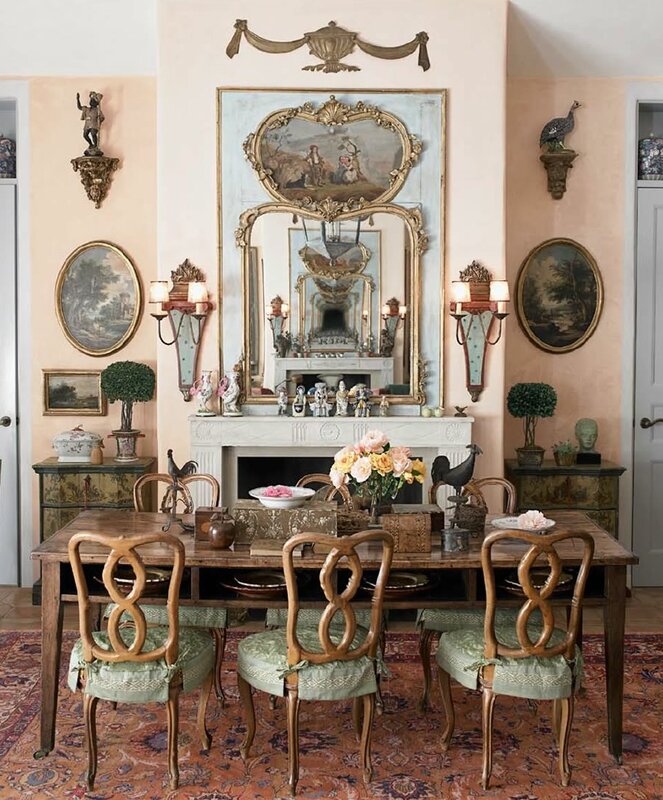 My very favorite mirror above a fireplace or console is a “trumeau”! A “trumeau” either has a painted scene or some lovely carving. This is what I do know! I LOVE “trumeaus”!! 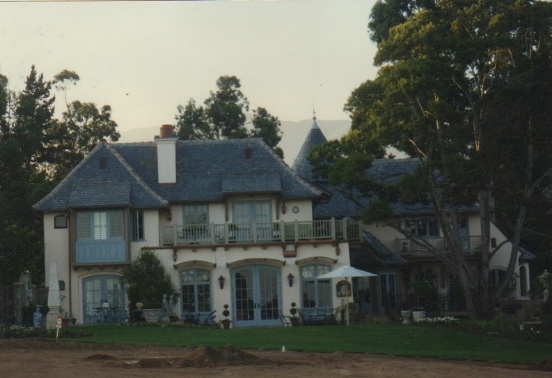 Our house in Pasadena……..had three trumeaus in the living room! It was a “pavilion” and copied from a lovely house outside of Paris built in the 18th century. During the eighteenth century , many rooms were paneled with “boiserie” carved and painted. Above the fireplaces and over consoles they often had a mirror included in the paneling to increase the light. discovered a pair of “trumeau” mirrors with two different scenes! I had never seen that before! Finding a pair of trumeaus with two different scenes was lucky beyond! Happily, we bought them , and they are a delightful part of our “big hall”! They have two delightful scenes of children playing and even a dog that looked like our dog, Georgie! 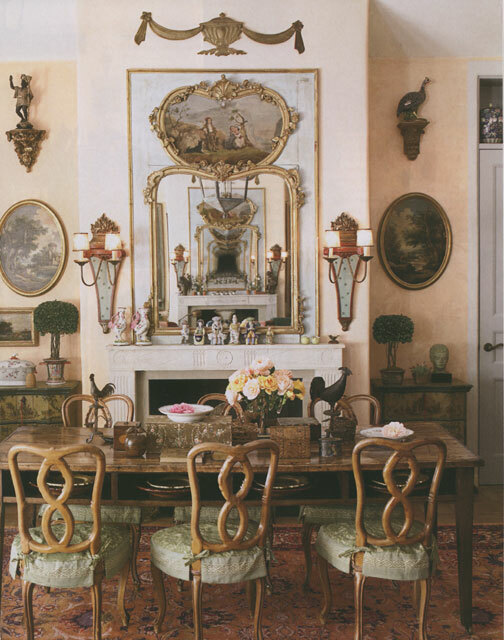 We had a lovely French Regency style house in Pasadena, which had four beautiful trumeaus! This is looking the other direction towards the dining room a pair of consoles with trumeaus. This console was in in the dining room. This console and mirror were in the entry hall! The lady who built our house in 1957 went to France with her architect to buy these antiques to incorporate into the French “pavilion” she was building! I am showing examples of others I’ve found! Well, there is a “secret place” in Montecito. Honestly; even close neighbors barely know it is there! One can only see it from the water……or walking on the beach going from the “Biltmore” east towards the “Miramar”! It was the dream job of a lifetime for me! “getting close”! “I think you want to go up there on Tuesday with Charlie and Nancy” (his wife, her stepmother)! His property was originally part of a subdivision of a large estate owned by the Hammond family; and it was slated to be more large condominium buildings which were built in 1970.
was a very special place. He had been a guest at a very unusual development in Oceanside, California, called “St. Malo”. It was developed starting in 1929..(it was the first gated community in San Diego County)! restrictions. This is seriously one of my favorite things I have ever seen on the coast of California. to take pictures and buy things. Many of the houses are extremely authentic; the people who built them went to France and brought back materials. The coast of California is not known for its fine architecture. Far from it. Frankly, it is pretty sad. Even pathetic. Never mind! “St. Malo” is a jewel on the coast. Charlie; being the visionary that he is, thought this would make sense in Montecito! I went with Charlie and his lovely wife Nancy up to see this property! YOWZERS!! It is a”flag lot” meaning that the first part of it is behind some beachfront houses…. (forget every single condominium you have ever seen); a common clubhouse with a tennis court, swimming pool, kitchen and a wonderful living room with poolhouse bathrooms! Charlie finally got the permits to build a “village” like St. Malo; and he was starting to build it! At first, I was hired to “decorate” the clubhouse! (which was not built yet). Now. Here is the clubhouse! Originally, Charlie hired me just to do the “Clubhouse”! My foot was “in the door”!! I designed it. I showed him samples and presented it all to him in his office. (there is a farm table with red chairs that don’t show in this picture)…they are to the right! “And, Charlie, there just needs to be one person doing all these houses you are building! And it needs to be me! I “get” your vision! And he did. And I did. And that is a true story of a dream job. My title was “Aesthetic Director”! the cabinets, the colors, the floors, the tiles (87 bathrooms all different hand painted tile! for the 23 “condominiums…the clubhouse ..and for Charlie’s own house, and another house! and the “condominiums ” which are all completely different from one another. This has never been publicized. So here we go! have rituals here. There is a monument honoring them. 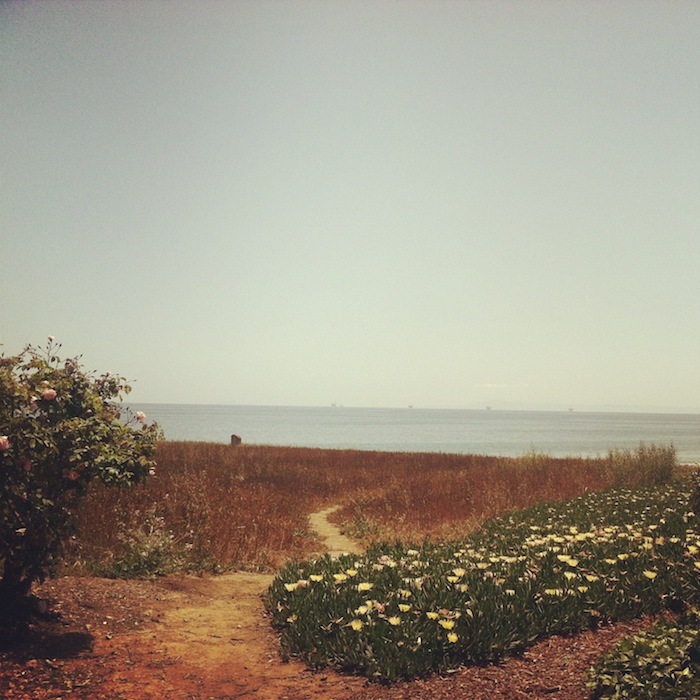 This an multi- acre open meadow right on the ocean in honor of their ancestors! Near the center to the left; you can see the monument! Here is the monument…..and the Indians have celebrations sometimes in this meadow! The views from these houses (not condominiums) go up and down the coastline; and the surfing beach is right to the left of them!